New Chapter Perfect Prenatal Multivitamin, includes targeted levels of whole-food folate, is formulated specifically to nourish mother and baby. Most people would agree that taking a daily multivitamin is a good idea – it’s often referred to as an “insurance policy” for covering nutritional gaps left by a less than optimal diet. 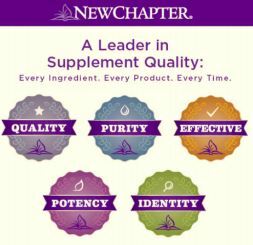 New Chapter believes a daily multi can be much more than a nutrient backstop. In fact, they believe their Organic, Whole-Food Multi’s can serve as the foundation of your complete nutrition program – with multiple benefits in support of your overall health and wellness. Warning: Accidnetal overdose of iron-containing products is a leading cause of fatal poisoning in children under 6. Keep this product out of reach of children. In case of accidnetal overdose, call a doctor or poison control center immediately. I took these before, during and after pregnancy (switching to the postnatal ones once I found out about them). They never once made me feel sick or constipated. I highly recommend these to all of my friends.